Medieval psalters were made to be used either for personal devotion or in church services, including the offices or daily cycle of prayers recited by monks. The Glenorchy Psalter was used in a monastery in Argyll, in Scotland, before the Reformation, but by the first quarter of the 16th century it was owned by the 3rd earl of Glenorchy, Colin Campbell. Its calendar, an aid to the manuscript's users in planning prayers and readings for services, lists many saints who were revered in western Scotland. The first letter of Psalm 1 ('Beatus vir', 'Blessed the man') in medieval psalters is usually the most elaborately decorated, nearly always bearing a scene of David, as king, ancestor of Christ, composer of the psalms or victor over Goliath. 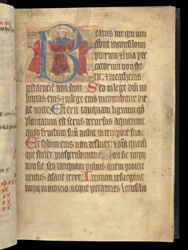 The Glenorchy Psalter has a picture of a figure who is either a priest or possibly a king in view of the crown he appears to wear. If a king, he may have been intended to represent David. Two thurifers (altar boys or deacons carrying incense) flank him, possibly evoking the hymns based on the psalms that are sung in church processions.